The Dodge Viper was released as a modern take on the classic American muscle car. The Viper first debuted in 1989 as a concept car before launching into full production in 1992. Everything about the Viper is over the top: cartoon-inspired styling, giant rear tires and thumping 400-horsepower V10 engine. 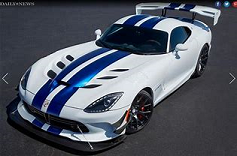 The first and second generation Vipers gave the impression that they were half-finished; little more than two seats tacked onto a roaring jet engine but with the release of the third generation in 2013, the SRT Viper has truly arrived in terms of both refinement and power.